Apollo and Starbuck witness Cylon Raiders destroying one of their own basestars; the Galactica intercepts another transmission of unknown origin. Adama's log on page 7 tells the reader that the fleet is entering its third week of hiding in the Korax Nebula, near the Canopus Wormhole. 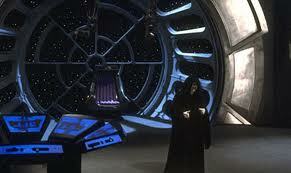 The fleet also receives another Earth transmission, as they did in "The Hand of God". This places the story not long after "The Hand of God", but still after the last published "season two" issue of the Realm Press comic books ("Search for Sanctuary" Part 2). Further, I have chosen to place the story after "Fire in the Sky" (part of Realm Press' Season III storyline) since it might be argued that Belial, the IL-series Cylon whom we later learned created the nano-cybrid that causes the Cylon infections seen here, based his creation on studies of the Apshaidian organic technology used in that earlier story. The opening narrative of this issue is the preamble of the theatrical version of the BSG pilot, which ends with "...far, far away amongst the stars...", the last line probably was originally written to suggest the "galaxy far, far away" slogan associated with Star Wars. On page 2, Starbuck refers to the meteoroid his and Apollo's Vipers are clinging to as an astralon. The term "astralon" seems to have been borrowed from the Encyclopedia Galactica, a non-canonical reference source to BSG published in 1979. On page 3, Starbuck incredulously asks Apollo if he's sniffing plant vapors. This is a reference by the writer back to Boomer's comment about a woman he and Starbuck meet on Carillon in "Exodus": "She must have been smoking plant vapor," a veiled reference to our Earth's own cannabis plant and its effects when smoked. Apollo and Starbuck are both depicted with gloved hands in their Viper cockpits, though the TV series never did depict them that way. The Viper joystick depicted on page 6 looks more like a video game joystick than the ones traditionally seen on the show. Notice what appears to be a finger firing toggle, not seen in the episodes. Adama's log on page 7 tells the reader that the fleet is entering its third week of hiding in the Korax Nebula, near the Canopus Wormhole. Possibly, "Canopus" is a reference to the second-brightest star in Earth's night sky (after Sirius), about 310 light-years away from our planet. If so, the Colonial fleet was not so far away from us at the time, cosmically-speaking. Also on page 7, Bojay explains that he and Sheba were surveying signals "beyond anything the Cylons would ever even think to explore: amplitude and frequency modulation." These are the AM and FM bands used by Earth for most popular radio broadcasts. The transmission discovered by Bojay and Sheba is one depicting U.S. President Franklin Roosevelt's speech at the New York World's Fair of 1939. The broken sentence translated by the Galactica's computer is: "I hereby dedicate the New York World's Fair of 1939, and I declare it open to all mankind." It was originally broadcast on April 30, 1939. An IL-series Cylon by the name of Abbadon is revealed to be in command of the Cylon world on the other side of the Canopus wormhole. In keeping with the sinister names generally associated with the IL-series, "Abbadon" is a Biblical term meaning "to perish". 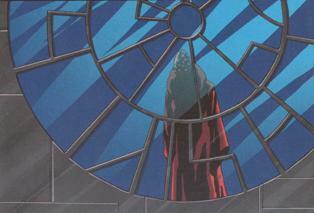 The window of Regent Abbadon's throne room on page 14 is similar to that in the Emperor's throne room on the Death Star in Star Wars: Return of the Jedi. Regent Abbadon's throne room Emperor's throne room in Star Wars: Return of the Jedi. On page 20, Starbuck uses the epithet "for Sagan's sake," which he had used a few times in episodes of the TV series. On the last page of the issue, it's unclear whether the jets the Cylon centurions use to fly through space to the Galactica are separate jet packs or part of the power packs built onto all centurions' armor.